My contribution includes a collection of 7 poems dolls, pictured below, which extend my exploration of female fairy tale characters and visual investigation of dusters. The event also coincides with my Women & Domesticity duster project currently on display at Sussex Coast College in Hastings. In addition to two exam boards it’s proving to be a busy week! It’s been a very busy few weeks, but last weekend I spent a lovely Saturday morning with Sussex Book Arts Collective running a workshop making Star Books. This is a structure I love to make myself, and one which I’ve had included in an exhibition. My version was made from postcards, flyers, maps etc that I collected during a student trip to Amsterdam. (What better way to use the stash I’d collected!) Following a couple of great eBay wins I had a collection of playing cards and old postcards, which were put to great use along with a selection of coloured card and items brought in by participants. And my daughter Daisy aged 8! It’s free to attend this drop in session, I’ll be on hand to help with inspiration, sewing techniques and generally getting people started with stitching a duster. If you’ve already made one, or have one in progress then join us too for some company and a chat. It would be great to see you at both or either events. The work I submitted includes 5 little ‘inside out’ books, which were instrumental in my thinking process when exploring relationships between cloth and the home, they ultimately inspired my embroidered dusters. 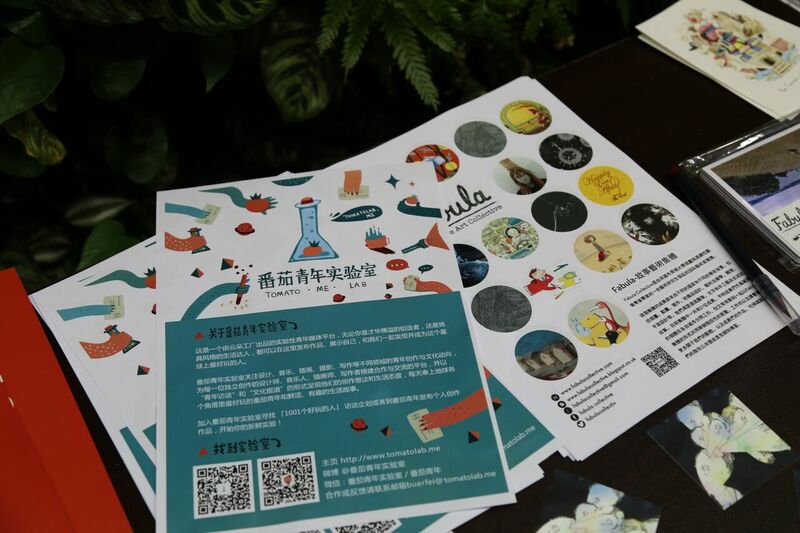 I’m part of an illustration and narrative focused called Fabula, and as part of this group my work is currently being exhibited in Beijing, China. 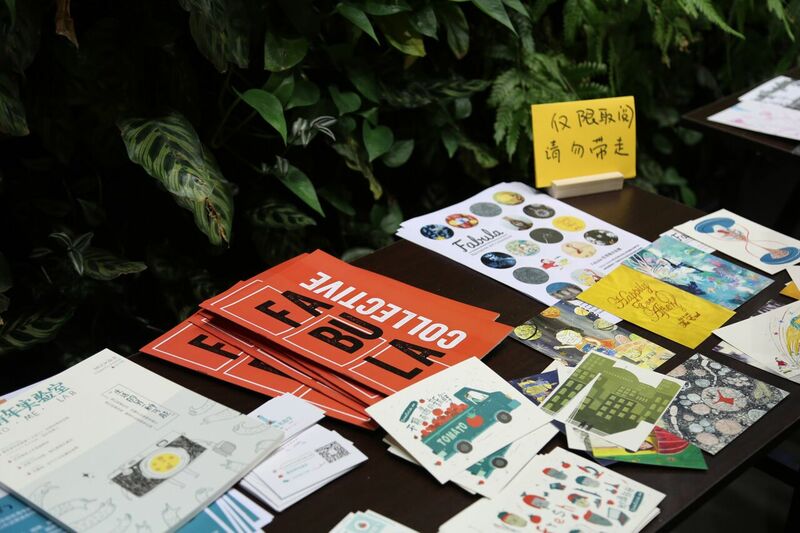 The theme of the event is ‘Wake up your life with illustrations!’ More information can be found on the website of Nancy Yang, who is our China based representative and who has kindly put lots of effort into making it happen for all of us. 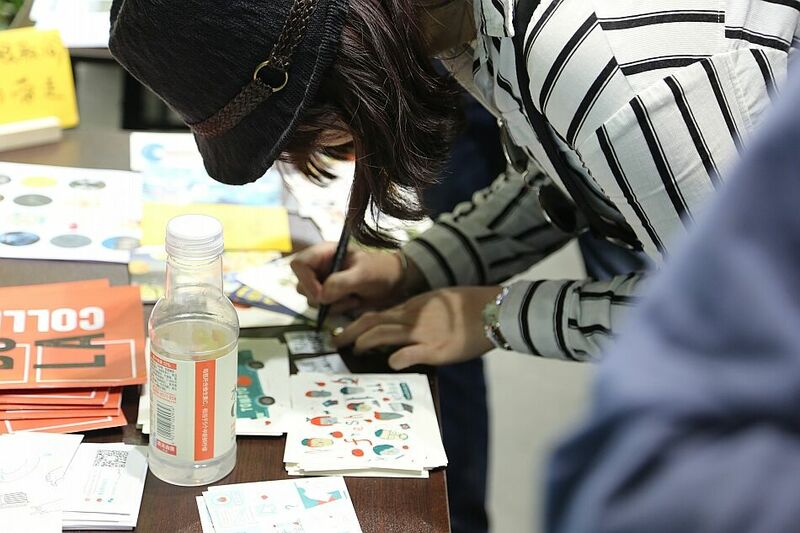 Here are a few pictures from the launch event (you can see my bright yellow postcard featuring one of my dusters). Unfortunately it’s too far to travel, but I’m there in spirit! 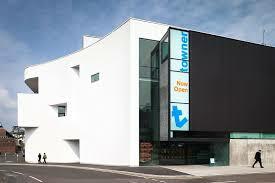 I’m off to a funding workshop at the Towner Gallery in Eastbourne today to find out more about funding for Art Projects, which I very much hope will inform a direction for my Women & Domesticity Duster Project . I also have a one-to-one surgery with the Arts Council so fingers crossed! Where did your passion for graphic design begin? I studied for a degree in Art & Design with a specialism in Graphic Design in the late 90’s; up until that point my education had focused around Fine Art and drawing but I quickly became fascinated with the potential power of visual communication. I was a mature student and a single parent with small children so studying for a degree was also about ultimately providing for my family whilst enjoying a creative and challenging career myself. I was offered my first graphic design job at my Degree show and cut my design teeth working within a marketing and business environment for companies such as BT and Astrazeneca. Following this I free-lanced for a while getting involved in every opportunity that came my way; this included packaging design, design for print, web, book design and illustration, which lead into my next job at Dorling Kinderley (part of Penguin Book Publishers) where I worked as a Project Art Editor on The Strand in London. I absolutely loved that job! Following this I ran my own company for 8 years, employing several members of staff and providing print, web and motion design. We worked for a wide range of companies but became known particularly for working with charities and not for profit organisations, which was incredibly rewarding. I started teaching 7 years ago following a request from a friend to teach a logo design workshop and haven’t looked back. I went back to studying too and completed a PGCE teaching qualification in 2009, followed more recently an MA in Sequential Design and Illustration. These days I both teach and practice as a graphic designer and illustrator, whilst trying to fit some personal projects alongside too. Who is your favourite designer? And why? I have several favourites and my influences are quite broad but I’m definitely a big fan of Alan Fletcher – his work is so loose and playful. In contrast I love just about everything that came out of the Bauhaus, from Annie Alber’s woven rugs, to Paul Klee’s paintings and Herbert Bayer’s theories on typography; I think it’s the geometry that particularly appeals. In terms of more contemporary designers I love Marian Bantjjes and Jenny Holtzer’s completely different approaches to typography. I think it’s important to be open to influence from lots of different sources, after all graphic designers don’t only communicate to other designers. How does other design work influence your own? Teaching is very much a two-way process. The students often inspire ideas or discover insights, which are exciting and new. Breaking design basics down into briefs and workshops can also help me see a problem from a different perspective. 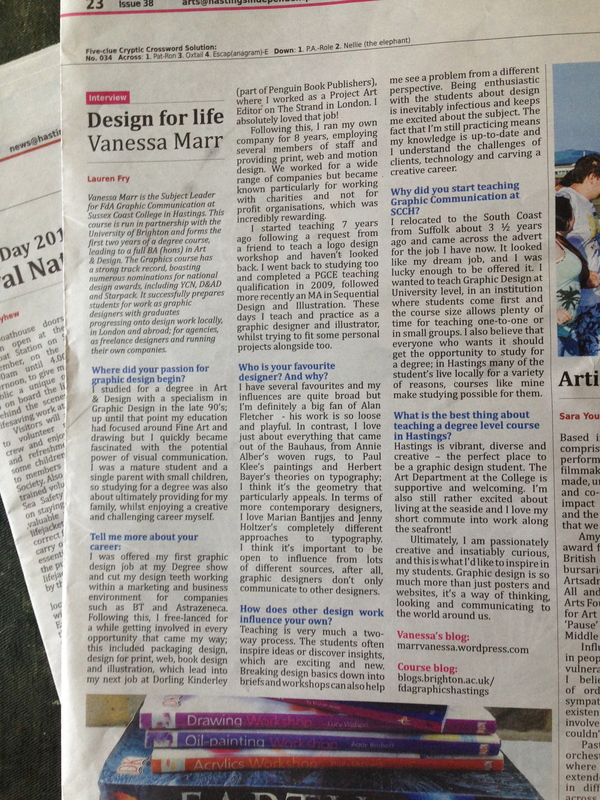 Being enthusiastic with the students about design is inevitably infectious and keeps me excited about the subject. The fact that I’m still practicing means my knowledge is up-to-date and I understand the challenges of clients, technology and carving a creative career. What is the best project you have worked on? I designed a set of books from scratch for Dorling Kinderley called the 15 Minute Language series. The idea was that if you spent just 15 minutes a day learning the basics then you could master a new language (I never tried it out!) They were very visual and used colour and photography as tools for learning. I spotted them in an Airport once on my way to a holiday and took a photo of myself beside them – the thrill of seeing my work out in the real world never diminishes! If you could do a one off design project for any brand, which one would it be and why? I’d love to design a book for Phaidon Book Publishers – their work is stunning! Why did you start teaching Graphic Communication at SCCH? I relocated to the South Coast from Suffolk about 3 ½ years ago and came across the advert for the job I have now. I looked like my dream job, and I was lucky enough to be offered it. I wanted to teach Graphic Design at University level in an institution where students come first and the course size allows plenty of time for teaching one-to-one or in small groups. I also believe that everyone who wants it should get the opportunity to study for a degree; in Hastings many of the student’s live locally for a variety of reasons, courses like mine make studying possible for them. What is the best thing about teaching a degree level course in Hastings? Hastings is vibrant, diverse and creative – the perfect place to be a graphic design student. The Art Department at the College is supportive and welcoming. I’m also still rather excited about living at the seaside and I love my short commute into work along the seafront! Do you have any exciting projects lined up that you want to tell us about? I have an exciting stop-frame animation illustration job for a large British food retail brand that I’m working on right now, with more work to follow in the autumn. They are rebranding so my drawings sequentially tell the story of their brand development over about a dozen pages of a sketchbook. Stop frame is a very slow production process; each page took several hours to film and I went through a whole stack of pencils and paper, as each element was hand drawn. This job is the perfect opportunity to apply my as a graphic design branding knowledge to my illustration skills. Ultimately I am passionately creative and insatiably curious, and this is what I’d like to inspire in my students. Graphic design is so much more than just posters and websites, it’s way of thinking, looking and communicating to the world around us.